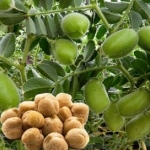 Сhickpea is a prospective and profitable crop with a large export capacity. In the last years, role of Russia in the growing of this crop increased. Currently, our country is the second exporter of chickpea after Australia. In 2016, Russia had 10.0% of total export volume of chickpea. For comparison, Russia had 1.3% and 7.6% of total export volume of chickpea in 2006 and 2011, respectively. A significant increase the part of the Russian Federation in world trade of chickpea indicates on significant increase of competitiveness of Russian chickpea in world markets. In 2017, chickpea took the 6th place in total export of grain from Russia (after wheat, maize, barley, pea and rice). In 2017, the main export directions for shipment of Russian chickpea was Turkey, Jordan, Egypt, Iran, India, Pakistan. In Russia, croppage and yield of chickpea annually increase. At the same time, there are few registered products (slightly more than a dozen of herbicides, few insecticides, fungicides and growth regulators) and permitted for application pesticides on this crop. For example, in 2017 outbreak of Ascochyta leaf spot of chickpea was observed in Bashkortostan because of dry weather. Up to now, there are no registered fungicides. Chickpea has a bad growth among weeds and, at the same time, is very sensitive to herbicides. All herbicides even in minimal doses significantly inhibit chickpea growth. Therefore, the problem of herbicide stress is very actual for this crop. Albit demonstrated a positive effect on more than 60 crops. For example, in Russia, Albit is registered on chickpea as plant growth regulator for increase the germination, activation growth and development, increase resistance to unfavorable climate conditions and diseases, increase yield, and improving yield quality. On chickpeas Albit is applied as antidote to reduce the phytotoxic effect of herbicides without decrease their protective efficacy. 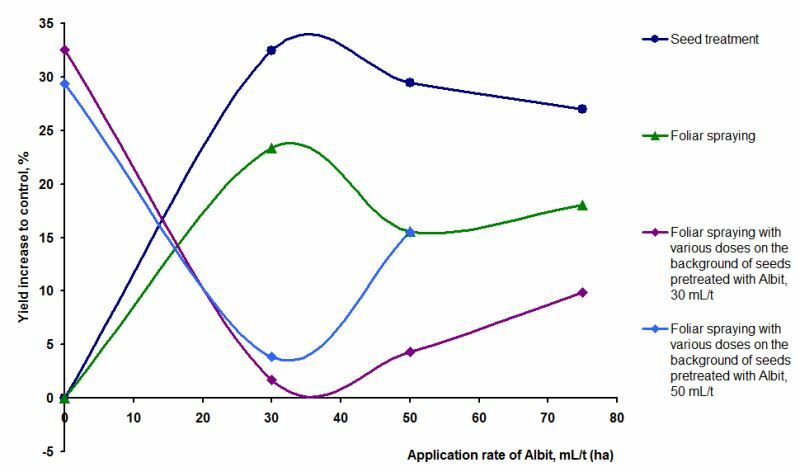 Albit is applied in tank mix with herbicides and also after herbicide treatment (the last variant of application is recommended in the case of overdose). Application recommendations. Seed treatment (30-50 mL/t) and foliar spraying with Albit at the stage of 4-5 true leaves (30 mL/hа, ВBCH 14-15) are recommended for maximal effect. A higher dose (50 mL/ha) is applied for plant immunization. Seed treatment or foliar spraying may be applied for maximal effect (effect of 2-fold treatment is lower than 1-fold one). Albit may be applied as antidote in tank mix with pesticides according to their perspective recommendations. Albit was used in field trials on chickpea in Agricultural Scientific Institute of South-East (Saratov oblast, 2005), in the Scientific Institute ‘Rossorgo’ (2010–2011). 3. control was without treatment. Sowing date – May 10, seeding rate – 180 kg/hа. In all variants, plants were treated with herbicide based on imazethapyr. Increased parameters of productiveness and yield were observed after Albit treatment relatively to control (without treatment) and chemical standard (see Table). Biological efficacy (BE) of Albit after seed treatment of chickpea against Fusarium root rots (causative agent Fusarium oxysporum) was 21.2%. Albit was applied on chickpea var. Krasnokutskij 195 in field trials of 2010 and 2011 years. In various doses (30, 50 and 75 mL/t, hа) Albit was used for seed treatment and foliar spraying (at the stage of 4-5 leaves) and also in combination of both these treatments. In other variant of this trial herbicide based on imazethapyr was applied at the stage of 3 true leaves. Hot and dry weather was observed in 2010 year. 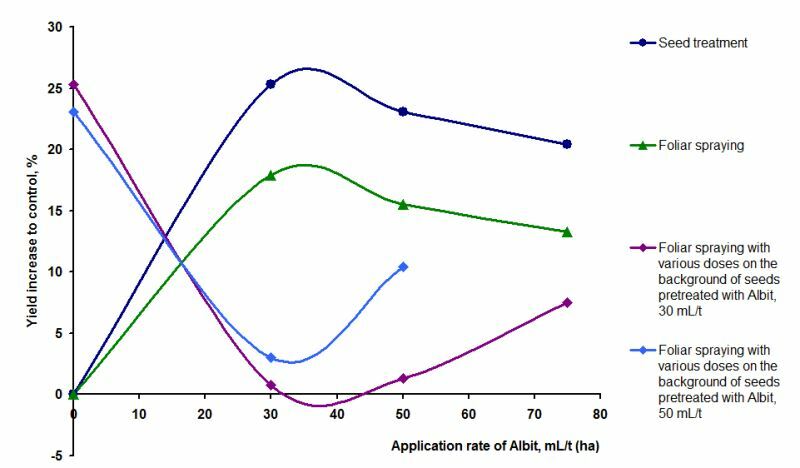 First of all, Albit had a positive influence on field germination of seeds (increased by 3.5-5.2%). It allowed to increase plant population and lay the basis for high productivity. Foliar spraying with Albit at the stage of 4-5 leaves also had positive effect. In spite of more favourable weather conditions of 2011 and increased yield (in 2010 yield in control was 0.74 t/hа, in 2011 – 1.07 t/hа), overall, the results were similar (Figs. 1, 2). Yield increase was maximal, when dose of Albit was 30-50 mL/t or 30 mL/hа. One-fold Albit application (seed treatment or foliar spraying) was more effective than 2-fold one. For example, additional sprayings of plants with pretreated seed (50 mL/t) even decreased effect than one-fold application in dose 50 mL/t (Fig. 1). In this case, probably, desensitization of plant protective reactions occurs after multiple applications. Combination of seed treatment and foliar spraying with Albit is effective on many studied crops. However, chickpea is exception: it is recommended seed treatment or foliar spraying with Albit. After Albit application yield increase of chickpea (up to 32.5% to control) may be explained by antidote effect of Albit. For example, plants of chickpea grown from seed treated with Albit, were more resistant to herbicide stress. Yield increase was 11.8-12.7% after application of standard based on Bacillus subtilis (protectant without antidote effect). Based on conducted trials, Albit increased chickpea yield by ca. 0.2 t/hа (yield increase to control was 19.0%). Yield increase was 0.01–0.35 t/hа depending on year, dose and method of application. The obtained data were confirmed in field trials of Saratov, Volgograd, Orenburg oblasts and Bashkortostan. Therefore, Albit is perspective product for increase the productivity of chickpea with growth regulating, anti-stress and protective effects.